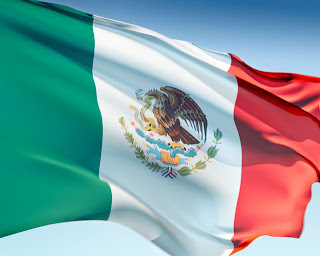 This is the flag of Mexico. Red, white, and green are the colors of the national liberation army in Mexico. The central emblem is the Aztec pictogram for Tenochtitlan (now Mexico City) thee centre of their empire. It recalls the legend that inspired the Aztecs to settle on what was originally a lake-island. According to the legend Huitzilopochtli (the Aztecs' principal deity) appeared to their leaders and guided his people to a place where a great eagle perched on a cactus killing a snake. This was the place elected for them by the god, the place where they will found their capital Tenochtitlan. The year was 2 Calli (Two House) or A.D. 1325.